"There is a world beyond ours, a world that is far away, nearby, and invisible. And there is where God lives, where the dead live, the spirits and the saints, a world where everything has already happened and everything is known. That world talks. It has a language of its own. I report what it says. The sacred mushroom takes me by the hand and brings me to the world where everything is known. It is they, the sacred mushrooms, that speak in a way I can understand. I ask them and they answer me. When I return from the trip that I have taken with them, I tell what they have told me and what they have shown me." 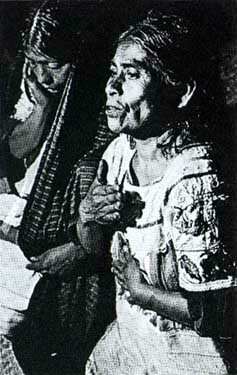 Thus does the famous Mazatec shaman, Maria Sabina, reverently describe the god given powers of the intoxicating mushrooms that she uses in her ceremony which has come from from ages past. Few plants of the gods have ever been held in greater reverence than the sacred mushrooms of Mexico. So hallowed were these fungi that the Aztecs called them Teonanacatl ("divine flesh") and used them only in the most holy of their ceremonies. Even though, as fungi, mushrooms do not blossom, the Aztecs referred to them as "flowers," and the Indians who still use them in religious rituals have endearing terms for them, such as "little flowers." When the Spaniards conquered Mexico, they were aghast to find the natives worshipping their deities with the help of inebriating plants: Peyotl, Ololiuqui, Teonanacatl. The mushrooms were especially offensive to the European ecclesiastical authorities, and they set out to eradicate their use in religious practices. "They possessed another method of intoxication, which sharpened their cruelty; for if they used certain small toadstools...they would see a thousand visions and especially snakes....They called these mushrooms in their language teunamacatlth, which means 'God's flesh,' or of the Devil whom they worshipped, and in this wise with that bitter victual by their cruel God were they houseled." In 1656, a guide for missionaries argued against Indian idolatries, including mushroom ingestion, and recommended their extirpation. Not only do reports condemn Teonanacatl, but actual illustrations denounce it. One depicts the devil enticing an Indian to eat the fungus; another has the devil performing a dance upon a mushroom. "But before explaining this [idolatry], one of the clerics said, "I wish to explain the nature of the said mushrooms [which] were small and yellowish, and to collect them the priests and old men, appointed as ministers for these impostures, went to the hills and remained almost the whole night in sermonizing and in superstitious praying. At dawn, when a certain little breeze which they know begins to blow, they would gather them, attributing to them deity. When they are eaten or drunk, they intoxicate, depriving those who partake of them of their senses and making them believe a thousand absurdities." Dr. Francisco Hernandez, personal physician to the king of Spain, wrote that three kinds of narcotic mushrooms were worshipped. After describing a lethal species, he stated that "others when eaten cause not death but madness that on occasion is lasting, of which the symptom is a kind of uncontrolled laughter. Usually called teyhuintli, these are deep yellow, acrid and of a not displeasing freshness. There are others again which, without inducing laughter, bring before the eyes all kinds of things, such as wars and the likeness of demons. Yet others are there not less desired by princes for their fiestas and banquets, of great price. With night-long vigils are they sought, awesome and terrifying. This kind is tawny and somewhat acrid." For four centuries nothing was known of the mushroom cult; and it was even doubted that mushrooms were used hallucinogenically in ceremony. The Church fathers had done such a successful job of driving the cult into hiding through persecution that no anthropologist or botanist had ever uncovered the religious use of these mushrooms. In 1916 an American botanist finally proposed a "solution" to the identification of Teonanacatl, concluding that Teonanacatl and the Peyote were the same drug. Motivated by distrust of the chroniclers and Indians, he intimated that the natives, to protect Peyote, were indicating mushrooms to the authorities. He argued that the dried, brownish, disk-like crown of Peyote resembles a dried mushroom so remarkably that it will even deceive a mycologist. It was not until the 1930s that an understanding of the role of hallucinogenic mushrooms in Mexico and a knowledge of their botanical identification and chemical composition started to become available. In the late 1930s the first two of the many species of sacred Mexican mushrooms were collected and associated with a modern mushroom ceremony. Subsequent fieldwork has resulted in the discovery of some two dozen species. The most important belong to the genus Psilocybe, twelve of which have been reported, not including Stropharia cubensis, sometimes considered a Psilocybe. The most important species appear to be Psilocybe mexicana and P. hoogshagenii. These various mushrooms are now known to be employed in divinatory and religious rites among the Mazatec, Chinantec, Chatino, Mije, Zapotcc, and Mixtec of Oaxaca; the Nahua and possibly the Otomi of Puebla; and the Tarascana of Michoacan. The present center of intensive use of the sacred mushrooms is among the Mazatec. Mushrooms vary in abundance from year to year and at different seasons. There may be years when one or more species are rare or absent--they vary in their distribution and are not ubiquitous. Furthermore, each shaman has his own favorite mushrooms and may forego others; Maria Sabina, for example, will not use Stropharia cubensis. And certain mushrooms are used for specific purposes. This means that each ethnobotanical expedition may not expect to find the same assortment of species employed at one time, even in the same locality and by the same people. The probability that more species will be found in use is far from remote. Chemical studies have indicated that psilocybine and, to a lesser extent, psilocine are present in many of the species of the several genera associated with the Mexican ceremony. In fact, these compounds have been isolated from many species of Psilocybe and other genera in widely separated parts of the world, although the evidence available suggests that only in Mexico are psilocybine-containing mushrooms at present utilized in native ceremonies. The modern mushroom ceremony is an all-night seance which may include a curing ritual. Chants accompany the main part of the ceremony. The intoxication is characterized by fantastically colored visions in kaleidoscopic movement and sometimes by auditory hallucinations, and the partaker loses himself in unearthly flights of fancy. The mushrooms are collected in the forests at the time of the new moon by a virgin girl, then taken to a church to remain briefly on the altar. They are never sold in the marketplace. The Mazatec call the mushrooms Nti-si-tho, in which "Nti" is a particle of reverence and endearment; the rest of the name means "that which springs forth." A Mazatec explained this thought Poetically: "The little mushroom comes of itself, no one knows whence, like the wind that comes we know not whence nor why." The shaman chants for hours, with frequent clapping or percussive slaps on the thighs in rhythm with the chant. Maria Sabina's chanting, which has been recorded, studied, and translated, in great part proclaims humbly her qualifications to cure and to interpret divine power through the mushrooms. Excerpts from her chant, all in the beautiful tonal Mazatec language, give an idea of her many "qualifications." "Here let me say a word about the nature of the psychic disturbance that the eating of the mushroom causes. This disturbance is wholly different from the effect of alcohol, as different as night from day. We are entering upon a discussion in which the vocabulary of the English language, of ally European language, is seriously deficient. There are no apt words in it to characterize one's state when one is, shall we say, 'bemushroomed': For hundreds, even thousands, of years, we have thought about these things in terms of alcohol, and we now have to break the bounds imposed on us by our alcoholic obsession. We are all, willy-nilly, confined within the prison walls of our everyday vocabulary. With skill in our choice of words, we may stretch accepted meanings to cover slightly new feelings and thoughts, but when a state of mind is utterly distinct, wholly novel, then all our old words fail. How do you tell a man who has been born blind what seeing is like? In the present case this is an especially apt analogy, because superficially the Bemushroomed man shows a few of the objective symptoms of one who is intoxicated, drunk. Now virtually all the words describing the state of drunkenness, from "intoxicated" (which literally means poisoned') through the scores of current vulgarisms, are contemptuous, Belittling, pejorative. How curious it is that modern civilized man finds surcease from care in a drug for which he seems to have no respect! If we use by analogy the terms suitable for alcohol, we prejudice the mushroom, and since there are few among us who have been bemushroomed, there is danger that the experience will not be fairly judged. What we need is a vocabulary to describe all the modalities of a divine inebriant...."
Upon receiving six pairs of mushrooms in the ceremony, this novice-participant ate them. He experienced the sensation of this soul being removed from his body and floating in space. He saw "geometric patterns, angular, in richest colors, which grew into architectural structures, the stonework in brilliant colors, gold and onyx and ebony, extending beyond the reach of sight, in vistas measureless to man. The architectural visions seemed to be oriented, seemed to belong to the...architecture described by the visionaries of the Bible." In the faint moonlight, "the bouquet on the table assumed the dimensions and shape of an imperial conveyance, a triumphant car, drawn by...creatures known only to mythology." Mushrooms have apparently been ceremonially employed in Mesoamerica for many centuries. Several early sources have suggested that Mayan languages in Guatemala had mushrooms named for the underworld. Miniature mushroom stones, 2200 years of age, have been found in archaeological sites near Guatemala City, and it has been postulated that stone mushroom effigies buried with a Mayan dignitary suggested a connection with the Nine Lords of the Xibalba, described in the sacred book Popol Vuh. Actually, more than 200 mushroom stone effigies have been discovered, the oldest dating from the first millennium BC Although the majority are Guatemalan, some have been unearthed in El Salvador and Honduras and others as far north as Vera Cruz and Guerrero in Mexico. It is now clear that whatever the use of these "mushroom stones," they indicate the great antiquity of a sophisticated sacred use of hallucinogenic mushrooms. 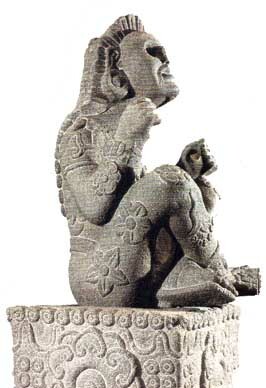 A superb statue of Xochipilli, Aztec Prince of Flowers, from the early sixteenth century, was recently discovered on the slopes of the volcano, Mt. Popocatepetl (see illustration, p. 62 and on jacket). His face is in ecstasy, as though seeing visions in an intoxication; his head is slightly tilted, as though hearing voices. His body is engraved with stylized flowers which have been identified as sacred, most of them inebriating, plants. The pedestal on which he sits is decorated with a design representing cross-sections of the caps of Psilocybe aztecorum, an hallucinogenic mushroom known only from this volcano. Thus Xochipilli undoubtedly represents not simply the Prince of Flowers but more specifically the Prince of Inebriating Flowers, including the mushrooms which, in Nahuatl poetry, Were called "flowers" and "flowers that intoxicate." Have psilocybine-containing mushrooms ever been employed as magico-religious hallucinogens of the New World? The answer is probably yes. A species of Psilocybe and possibly also Stropharia are used today near the classic Maya ceremonial center of Palenque, and hallucinogenic mushrooms have been reported in use along the border between Chiapas in Mexico and Guatemala. Whether these modern mushroom practices in the Maya region represent vestiges of former use or have been recently introduced from Oaxaca it is not possible as yet to say. Nevertheless, evidence is now accumulat ing to indicate that a mushroom cult flourished in prehistoric times-from 100 B.C. to about A.D. 300-400 in northwestern Mexico: in Colima, Jalisco, and Nayarit. Funerary effigies, with two "horns" protruding from the head, are believed to represent male and female "deities" or priests associated with mushrooms. Traditions among contemporary Huichol Indians in Jalisco also suggest the former religious use of these fungi "in ancient times." What about South America, where these psychoactive mushrooms abound! There is no evidence of such use today, but indications of their apparent former employment are many. The Yurimagua Indians of the Peruvian Amazon were reported in the late seventeenth and early eighteenth centuries to be drinking a potently inebriating beverage made from a "tree fungus:' The Jesuit report stated that the Indians "mix mushrooms that grow on fallen trees with a kind of reddish film that is found usually attached to rotting trunks. This film is very hot to the taste. No person who drinks this brew fails to fall under its effects after three draughts of it, since it is so strong, or more correctly, so toxic." It has been suggested that the tree mushroom might have been the psychoactive Psilocybe yungensis, which occurs in this region. In Colombia, many anthropomorphic gold pectorals with two dome-like ornaments on the head have been found. They are in the so-called Darien style, and the majority of them have been unearthed in the Sinu area of northwestern Colombia and in the Calima region on the Pacific coast. For lack of a better term, they have been called "telephone-bell gods," since the hollow semi-spherical ornaments resemble the bells of old-fashioned telephones. It has been suggested that they represent mushroom effigies. The discovery of similar artifacts in Panama and Costa Rica and one in Yucatan might be interpreted to suggest a prehistoric continuum of a sacred mushroom cult from Mexico to South America. Further to the south in South America, there is archaeological evidence that may suggest the religious importance of mushrooms. Moche effigy stirrup vessels from While the archaeological evidence is convincing, the almost complete lack of reference in colonial literature to such use of mushrooms, and the absence of any known modern hallucinogenic use of mushrooms among aboriginal groups of South America, gives cause for caution in the interpretation of what otherwise might easily be interpreted as ancient mushroom effigies from south of Panama. If, however, it becomes evident that the various archaeological artifacts from South America mentioned above do represent hallucinogenic mushrooms, then the area for their significance in America will be greatly amplified.